For some years now, inflatable toys have been quite a rage amongst children of all age groups. These toys can widely be seen at theme parks, neighborhood recreational areas, plays-schools and allied places. It can be said that without inflatable toys, any sort of fun or leisure outing with kids these days is almost incomplete. 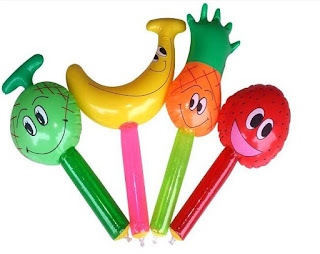 Inflatable toys are available in wide variety, from simple cartoon or animal shaped toys for toddlers to big water trampolines for water sport and theme park fanatics. Moreover, since these consist of negligible plastic parts, inflatable toys are not considered a safety hazard for infants and small babies. Apart from kids and toddlers, these inflatable toys are widely used by grown up people in water parks, pool parties etc. Inflatable toys are toys that need to be filled up with air, hydrogen or helium to achieve their pre-defined shape and size. When not inflated, the toys have a comparatively lesser size. Along with allowing for easier storage, this virtue of inflatable toys also allows for easier transportation of these if required.